Sonic Dash from Sega is an endless runner game, and while it�s true that there are a lot of these on the iOS, this is more than just a Temple Run clone. The graphics are very impressive and gameplay is very smooth. Here you control the blue hedgehog as he goes through many of the obstacles in the game, and it�s a lot of fun. The game controls are very easy as you swipe left, right, up or down to get past the obstacles. Swiping down will also turn Sonic into a ball and strike at his opponents. This �spin attack� is one of the most effective tactics in the game and one you will definitely be using. Part of the game�s charm is the easy controls, as anyone who has ever played Sonic will be familiar with the controls. 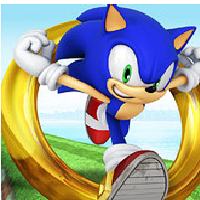 Also, the other elements like loop de loops, collecting rings and spin attacks have long been associated with Sonic, and it�s really nice they are all here. But above all, the game feels fast. This is a prerequisite for any good Sonic game and that is what makes this one click. As far as presentations go, Sonic Dash is one of the best. It may not be as �realistic� as the other games on the iOS, but in terms of appearance, sound and visuals, this is right up there with the best Sonic games Sega has released. Even if you have never played them before this one is very easy to pick up and will have you hooked. Simply put, if you are looking for a good endless runner, Sonic Dash is one that you should not miss.